This year I was as keen as ever to get down to the Malvern Spring Show – as you will know from previous articles, it is one of my favourite shows and often comes a close second to Chelsea. I always head to the show gardens first, to see what the exhibitors have come up with and get a good look before the crowds come in. Having been very impressed with the standard of the gardens last year, I was rather disappointed this year and felt the overall quality was lower, both in design and execution. The one garden that stood out for me as being head and shoulders above the rest was Mark Draper’s “Chic City Space”. Although there was nothing particularly innovative about this garden, the whole project was beautifully executed and the mixture of strong architectural box with cottage garden planting worked very well. This was Mark’s first show garden and he won a gold and Best in Show for the exhibit. Just a little further down from this garden was Alex Bell’s “Learning Curve”. I loved Alex’s garden last year: it was completely sustainable, very low-cost and contained lots of bicycle wheels! Alex won a gold for this year’s exhibit, which was all about teaching children in an outdoor space. The garden was based on a spiral, and going into the garden had quite a magical feel with lots of interesting details along the way. However, I was surprised this garden got a gold as many of the plants were looking a little battered and, by his own admission, Alex had taken on too big a plot to feel he had completed it well. 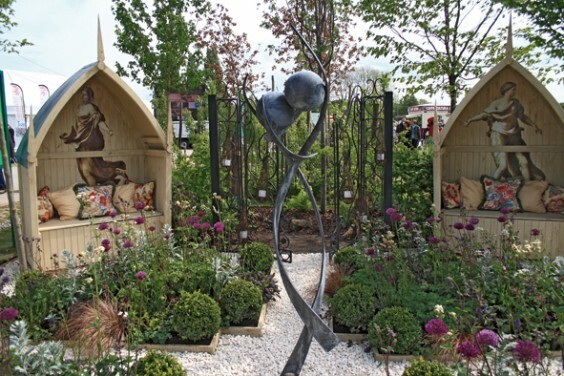 Ten of the show gardens were also entered into the Chris Beardshaw mentoring scheme and all of them had been given the theme of dance to work on. Only one stood out to me as an interesting and well-designed garden, and that was Paul Hervey-Brookes’ garden “A Dance to the Music of Time”. Paul had split the garden into two distinct areas – the front, formal part featured raised beds and box hedging with a very beautiful “dance” sculpture in the centre. Two arbours faced into the space and between them a gateway led you into the second part of the garden, which was a wild woodland planting. What I liked about this garden was the detail and thought behind the subject, but also that it made sense within its space and drew you in to want to know more. This garden won a bronze from the judges and Paul won the mentoring scholarship. When I arrived on the preview day of the show all the Chris Beardshaw gardens had girls in strange outfits sitting in them – I later found out that these were part of a fashion show that Malvern was trying out this year. I think it was an attempt at sophistication, but it didn’t work for me. Most of the girls looked very cold sitting outside on a windy day and it detracted from the story each garden had to tell. Having looked at all the gardens, I always head straight for the floral marquee, and happily there was no disappointment here. The exhibits were stunning, all the specialist nurseries were out in force and you could find displays on everything from pitcher plants to Acers. This part is one of Malvern Show’s great strengths – the smaller, specialist nurseries who can’t afford to do Chelsea come to this show. It’s early enough in the year for them as the growing season is just starting and they can sell the plants from their stalls. I was really pleased to see my friends Kim and Rob do so well with their Cottage Herbery stand; they won a well-deserved gold. The exhibit was really lovely with a little green roofed shed and wheelbarrow full of salad at the centre, surrounded by an abundance of their wonderful herbs and cottage garden plants. Kim told me the exhibit had been designed and built in three weeks as the plants for their first idea had all been burnt by the frost. It really showed what a little adrenaline can do. So here is my plea for the Malvern Show: don’t try to become a sophisticated show like Chelsea, but do what you do well, with stunning plants at the centre and show gardens to match the lovely rural atmosphere we know and love.